I’ve been tracking the progress of the number of plays of Ingenious and Coloretto and today, for the first time, Ingenious (currently at 13,668 plays) has seen more plays than Coloretto (currently at 13,612 plays). Clans came in a distant third with only 4290 plays. In any case, keep enjoying the games. Sophie and I played a round of Samurai and she beat me fair and square. After the game, we talked about what we would have done differently and I was able to see that I lost the game on my last play. I had the majority of High Hats, Sophie had the majority of Buddhas. I was racing for the fight for the majority of Rice Paddies. However, what I should have done was to remove the last High Hat ending the game before the Rice Paddy battle was resolved. Instead, Sophie outwitted me with the ‘switcheroo’ tile swapping a Buddha for a Rice Paddy and whammo, I was dead. Good job Sophie! I spent the afternoon on my first ‘full’ detailing of my Mini Cooper S but later in the day we managed to get in a game of Oasis designed by Alan Moon and Aaron Weissblum. The game ranks a 7/10 on BGG and it was on my list to check out from the CABS game library. The kids and I sorted out the pieces and decided to give it a go. The game is conceptually very simple. It’s an area control game to same degree but there isn’t the direct conflict that you’d get from China, El Grande, or even Carcassonne. Players, instead expose offerings in a San Marco/Andromeda-esque fashion in an attempt to lure other players to select their offering of cards. Once selected, players resolved the actions of the cards they’ve taken and the round ends. The offering cards allow players to place tiles on the board in one of three flavors: Steppe, Oasis, or Stony Plains. Groups of adjacent tiles are owned by individual players indicated by one of four pawns each player possesses at the beginning of the game. Tile placement restrictions are few and relatively lenient. In general, there are no direct conflicts between players beyond laying tiles that block expansion by rivals. Tiles are never removed and no merges are allowed. In addition to tile placement, offering cards allow players to place Camels on the board without restriction, grab additional offering cards, and most importantly select scoring tiles in one of four flavors: Commodity, Ovoos, Watering Hole, and Horses. 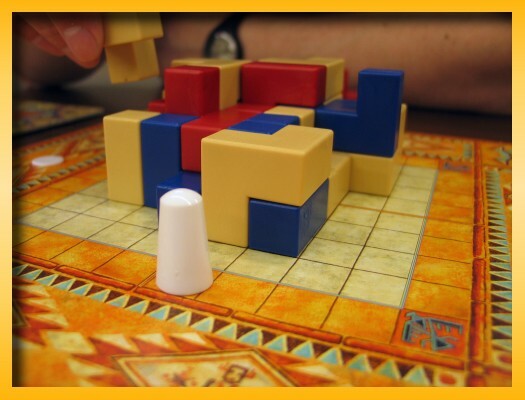 The scoring tiles correspond to the four items you place on the board Camels, Stony Plains, Oasis, and Steppe respectively. When a player collects a scoring marker, it’s placed face down in front of the player and held until the end and used in the final score calculation. The turn order is not strictly circular but instead it’s based on each player holding a numbered token. The player with the number 1 token exposes his offering first. If the player offers only one card, he receives 2 cards to place at the bottom of his offering stack. If he offers 2 cards, he only receives 1 card. If he offers the maximum of 3 cards, he receives no additional cards. At no point in the game do players view their offering cards. Play continues with the player with the next highest numbered token. After all offerings are exposed, the number 1 player selects an offering (other than his own) and gives his numbered token to the player in exchange for the offering. The numbered token is placed face down and will become that player’s token for the next round. The last player is the only player allowed/forced to take his own offering (if it’s still available). When the next round begins, the numbered tokens are turned face up and the player with the number 1 token receives an additional action he can take as a bonus for securing the 1st position. For camels, players determine their largest group of adjacent camels and multiply the number of camels in that group times the number of Commodity tiles they secured earlier in the game. Players then multiply all of the tiles in each flavor they have control over times the number of corresponding scoring markers they secured. The player with the highest score wins. 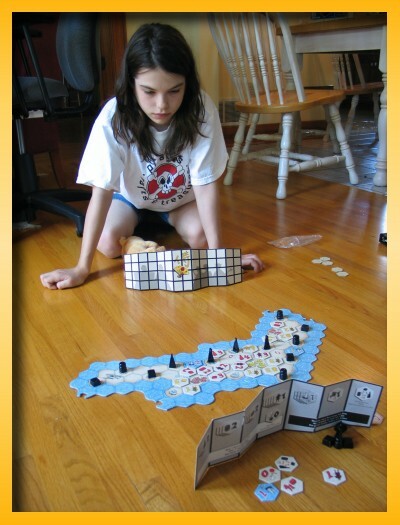 The game is enjoyable, moves quickly, and is great for kids. The low amount of direct conflict and backstabbing (or at least the ability to play the game in that fashion) helps the younger kids feel like there are no bad plays. The game is, however, not just an offensive game good for kids. There are plenty of decisions to be made concerning how many cards to offer, how to entice the number 1 player to take your offering so that you can secure the first position in the next round. The decisions as to where and how to place your tiles and which tiles to focus on certainly tingle the game senses. On the downside, I felt the game lacked something when played with three. The offering choices are very limited giving the game a more random feel. I don’t expect that adding more players will pull the game into the realm of high strategy but with three it’s certainly an exercise in tactical sparring. Regarding the offerings, I’m curious if there exists a variant where players are allowed to see all and/or some of their offering cards. I’ll have to dig a little on BGG to see. However, I’m sure I’m jumping the gun and I should stop and enjoy the game as the rules are written before making any rash judgements. Overall, Oasis is a good game and I’d be happy to add it to my game collection because of its quick play, ease of learning, low level of direct conflict good for non-gamers, kids, and/or light play. CABS has finally moved out of their New Market Mall location and they’ve landed in what I would say it a pretty nice space. The new space is twice the size of the space depicted above (two long rectangular rooms joined by two doors along the long sides of the rectangle) residing in a mall area just north of Morse Road near the Easton Mall. 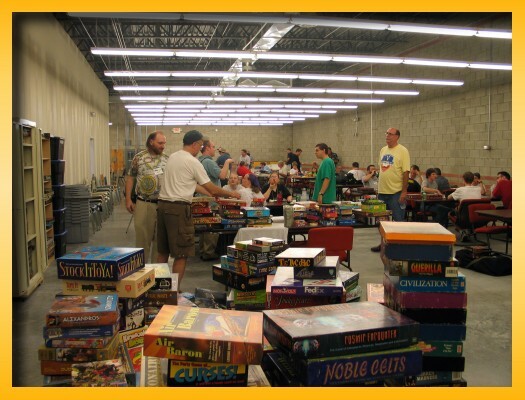 The CABS game library is still in a state of flux from the move and from it’s trip to and from Origins last week but you can see some of the games piled up waiting to be organized and tagged again for the member library check out. My friend Rich came tonight and became a new CABS member for the remaining portion of 2006 but unfortunately we both arrived at a time that was offset from most games so we ended up having to play some two player games until we finished up when other tables were finished up. 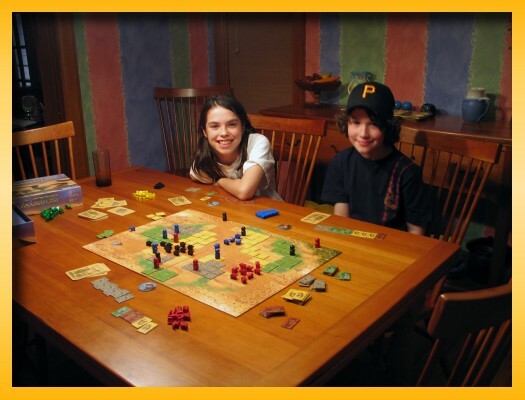 We first played Pueblo, a Rumis-like game for 2-4 players. I liked Pueblo. To me it felt a little more strategic than Rumis. In Rumis players vie throughout the game to limit the number of visible squares on the growing structure when viewed from above. Your Rumis pieces are all different shapes and the rules of block placement are more strict. However, players are striving for the single end game score. 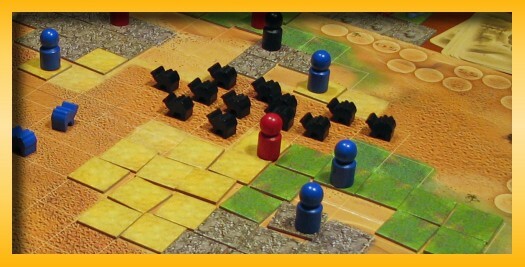 In Pueblo, all players possess the same shaped blocks. Your blocks are of two different colors (neutral and ‘your’ color) grouped into pairs. On your turn you choose to play a single neutral or a colored block from a pair. On subsequent turns you must exhaust the other block from the pair before moving to the next pair. After placing your block you move the Chieftain around the track from 1-4 spaces so that he can view your handiwork. After placing the Chieftain, you score points based on what colored blocks he can see from his position. The higher the block, the higher the value of the points. When the Chieftain is placed on a corner block, the quadrant for the corner is scored by counting those colored blocks that are visible from above. 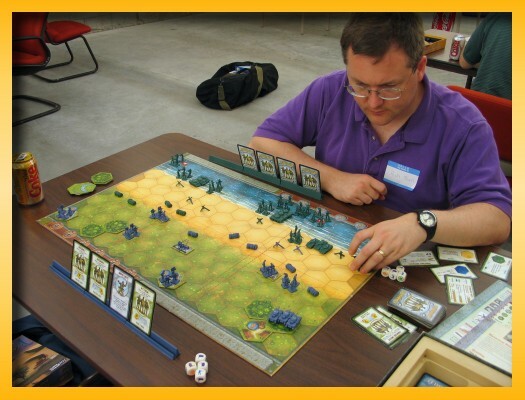 After the last block is placed, the Chieftain makes one final lap around the board and every single position is scored and the player with the smallest score wins. I like the tension of determining how best to minimize your score by limiting the exposure of your colored blocks, maximizing the exposure of your opponents blocks through defensive block placement, and tactical positioning of the Chieftain. Between Rumis and Pueblo, I’d give Pueblo the nod. 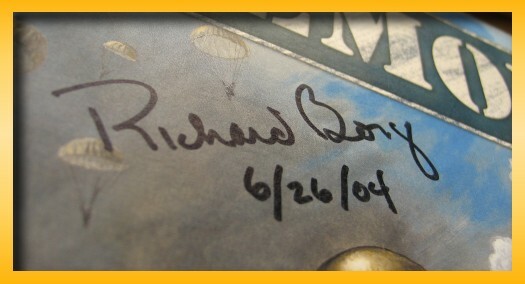 Next up, Rich and I played the signed copy of Memoir ’44. Memoir ’44 is an okay game to pass the time but it’s not something I long for or have a strong desire to work at getting better. I had fun playing the Axis side of the Sword Beach scenario though. Sword Beach is a really tough cookie for the Axis side. Your center is soft even though you have a bunkered artillary and you have a soft left flank. After Rich and I finished up we talked with a first-time visitor as well as another player who wanted so badly to play someone in M’44. Unfortunately, we were pretty much killing time to get in a larger Eurogame. We pulled the first time player into a game of Ra where both he and Rich did very well. It was my second playing of Ra where I presented a dismal performance and came in a distant last in a five-player game. I left early but managed to snap a picture of the signed copy of Tigris and Euphrates. 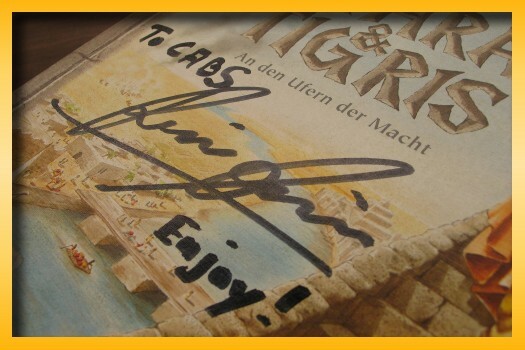 At least I think it’s signed by Reiner Knizia. The dots seem to be in tthe right places and I’m not sure who else would have signed the box. Anyway, that’s all I have. It was a short night and I’m turning in a little early. Tomorrow is a VERY big day that I’ll blog about tomorrow. I don’t want to be too sleepy for my 9am appointment.